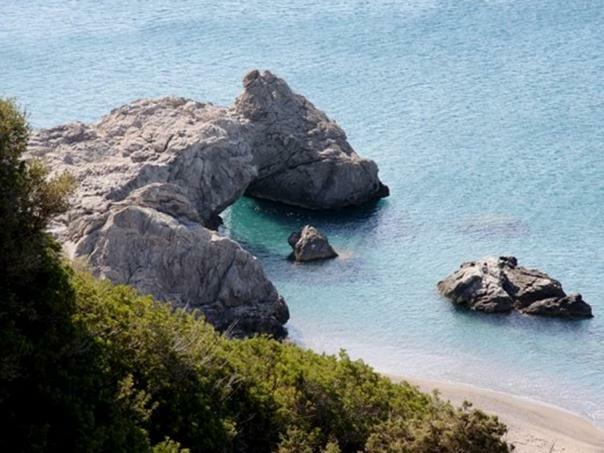 The beautiful beach of Listis is located 64km southeast of Heraklion, 3km west of Keratokambos and 8km east of Tsoutsouras. This quite small but idyllic beach has crystal clear waters and sandy seabed, ideal for both swimming and snorkeling. Listis beach features rock outcrops both in the water and on the shore. On the east part, there is a huge rock, called the rock of Listis (i.e. bandit). Listis beach is accessible only by private cars and motorbikes. If you drive from Heraklion, take the provincial road Knossou-Harakas, towards the south. Drive past Knossos, the villages of Arkalohori and Viannos and head for Keratokambos. Little before entering the village, turn right towards the west and after 1,5km you may have to park. In order to reach the beach you have to descend a steep slope.